The Rourke Baby Record (RBR) was developed in 1979 by Drs. 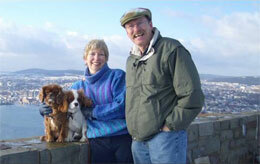 Leslie and James Rourke, who were at that time rural family physicians in Goderich, Ontario, Canada. Despite many changes over the past 30+ years, the basic philosophy of the RBR system of well baby/child care has not changed. It functions as a structured form for charting, acts as an aide-mémoire, allows for efficient use of time, encourages a team approach, and is an ideal teaching tool for comprehensive, evidence-based well baby/child care from 0 to 5 years of age. The Rourke Baby Record has been updated periodically since 1979. In 1998 in collaboration with Dr. Jacqui Wakefield and colleagues at McMaster University, the tool was revised to include the evidence-based recommendations from the 1994 Canadian Task Force on Periodic Health Examination (CFTPHE). Since 1999, the Rourkes have collaborated with Dr. Denis Leduc, a Past President of the Canadian Paediatric Society (CPS). The RBR is widely used across Canada and has become de facto a standard tool for well baby/child care. It is endorsed by the Canadian Paediatric Society (CPS), the College of Family Physicians of Canada (CFPC), and Dietitians of Canada, and is cited in review articles and textbooks (10-18). Rourke L, Godwin M, Rourke J, Pearce S, Bean J. The Rourke Baby Record infant/child maintenance guide: do doctors use it, do they find it useful, and does using it improve their well-baby visit records?. BMC Family Practice 2009;10:28.